THE BILLBOARD IS NOW UP!! It took 1200 to get it in place, and we've been paying 300 a month in billboard rent since March. We must continually raise money to keep it up! We need $300 a month to maintain it. Please donate to help us keep it in place. We almost have enough funding to keep it in place through February 2019. Please help us keep it up through the rest of the year! This fundraiser has been organized by The Fall Line Podcast and Unresolved podcast. 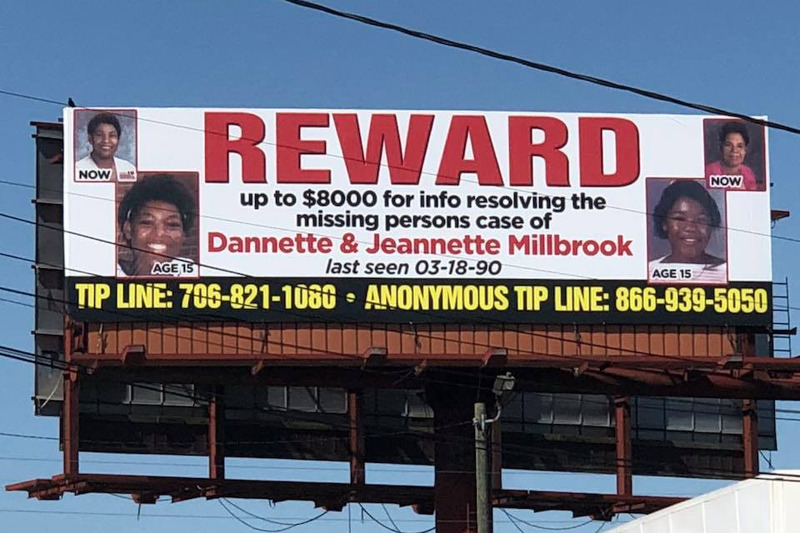 The amazing listeners of The Fall Line Podcast have donated $3,000 to create a reward in the case of missing Augusta, GA twins Dannette and Jeannette Millbrook. Along with generous donations of $2,500 each from Encompass Studio and the Osteen Law Firm, and $2000 from Little Petal Clothing, the total reward fund is now at $10,000. That is certainly enough money to spark renewed interest in the twins’ case and generate new tips. Unfortunately, the family has recently learned that the Richmond County Sheriff’s Office has decided not to announce or publicize the reward. The twins’ sister has been hard at work, along with Michael Whelan of The Unresolved podcast, hanging up fliers to spread word of the reward. This billboard lets residents who lived in the area at the time see that a reward is being offered. Our greatest hope in this case is that someone who knows something from the past will be motivated to speak. Assuring that the public knows about the reward is vital to making that hope a reality. Thank you! ——— Below, you can find more general information about the case and who we are. Thank you for all the continued support! We have managed to fund the billboard through May, and have begun to run giveaways to encourage donations. Any donation of $10 or above between 3/18 and 4/19 2019 will automatically put you in the drawing to win a SIGNED copy of Rabia Chaudry's book, Adnan's Story. Rabia has graciously donated this prize to help us, and will send it directly to the winner! To enter, donate at least 10 dollars and please use your first and last name (or instagram or twitter handle) so we may contact you. Thank you so much for your continued support. Thank you so much to everyone who has donated! We have enough to keep the billboard up through March, and are currently seeking funds to continue it beyond that. We will be raising money for this project for as long as the twins need awareness, so your donations are incredibly, gratefully appreciated.